If darn dog Chloe had her way, she’d be back to her old ways, sleeping on daughter’s bed, jumping up on the couch and running around the back yard, barking at the neighbor dogs out for their daily walks. Three and a half weeks after having surgery to alleviate a bulging disc in her spine, you’d be hard-pressed to notice anything wrong with her if it wasn’t for the strip of shaved hair on her back. Unfortunately for Chloe, she’s still restricted on what activities she’s allowed to do. No jumping or running and not a lot of following us around in the house. She has gone on a short walk or two, although Hurricane Patricia remnants have nixed that the last few days. 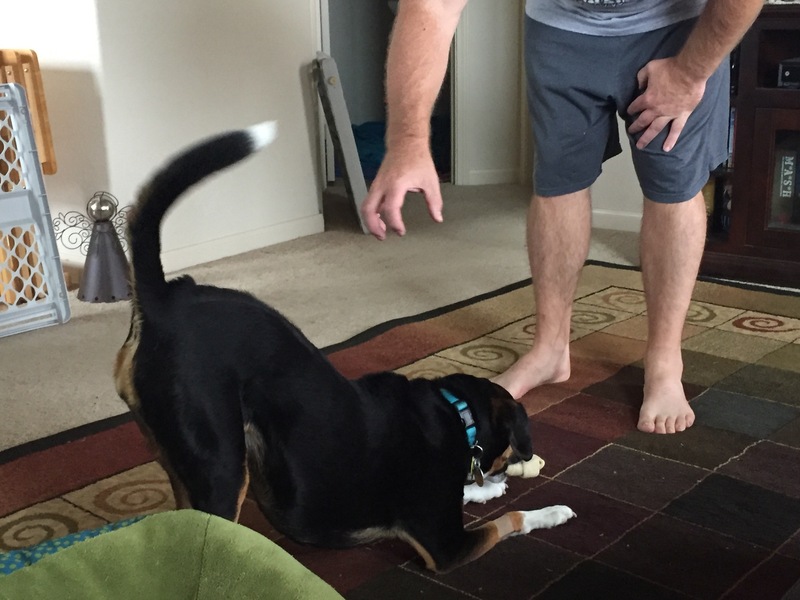 The most excitement she’s allowed right now is chewing on a bone and growling at husband or me when we tease her that we’re going to take it away. 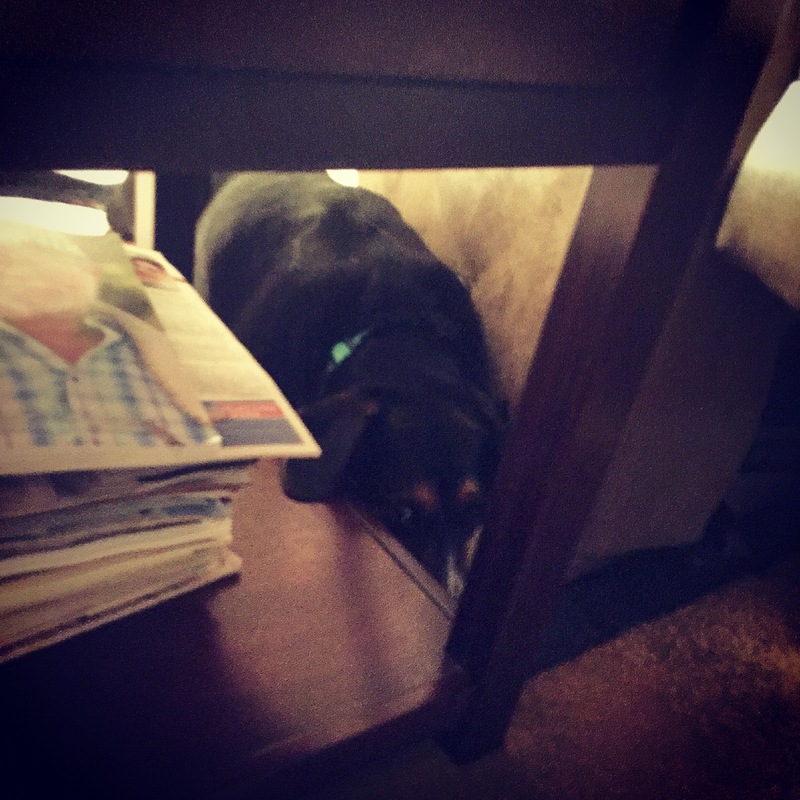 We’ve also noticed a few strange habits starting, like hiding/laying behind or between the chairs and end tables (above photo) in the living room. 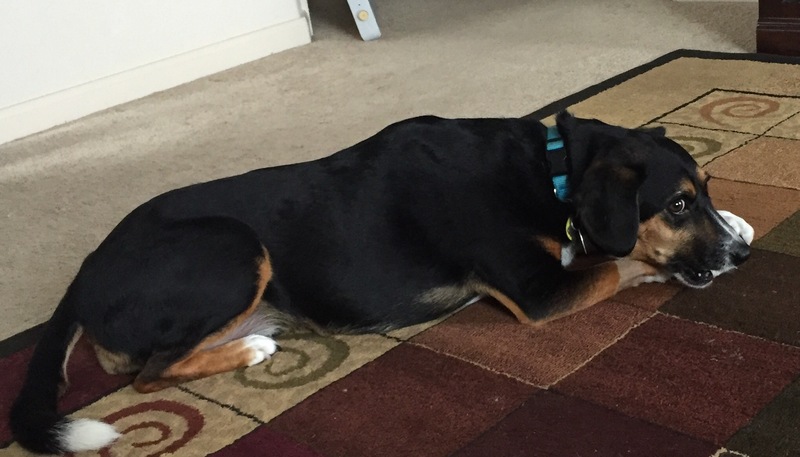 Of course, the living room is where she has been forced to spend all of her time when she’s not sleeping in the half-bath or going outside to do her business. Not sure what’s behind this, other than she’s exploring every square inch of the one room she’s allowed in. And that maybe she’s trying to annoy us for not letting her go in other rooms. Truthfully, she’s been really, really good about her confinement. Although she’s looked longingly at the couch, she’s only tried to jump on it once. And not once has she tried to knock down or push over the gate separating the living room from the rest of the house. Keep up the patience Chloe. In just a few days, you’ll actually get to go outside without being attached to a leash. And when the neighbor dog on the other side of the fence growls at you, you’ll be able to bark right back and follow it from one end of the fence to the other. It’ll be just like it always was.